Vet Tip of the Day: Osteochondrosis Dissecans - More Lameness! I'm going to continue discussing lameness today. I'm also going to confuse you by presenting another case in which I did not follow the cardinal rules of lameness diagnosis: 1) physical examination 2) gait evaluation 3) diagnostic nerve blocks 4) diagnostic imaging. In the horse I will discuss today, I skipped step 3, and will explain why. In today's discussion I am simply going to present this case, and tomorrow will discuss the disease process in more detail. Look at the x-ray here - this is the horse's stifle, the joint which corresponds to our knee. The patella is the triangular shaped bone at top right of the picture. It rests against the bottom of the femur (your thigh bone) and slides up and down on two ridges called the trochlear ridges. These ridges end in the condyles, which on the x-ray are the two rounded knobs at the end of the femur. Below the femur is the tibia (your shin bone). Look on the trochlear ridge just below the tip of the patella and you will see a small piece of bone separated from the trochlear ridge by a black shadow. This is a classic lateral trochlear ridge OCD lesion. Now here is the case presentation. Classy is a 5 year old thoroughbred mare. She never raced, but did train for the track as a 2 year old. She was pulled from training due to "splint bone issues" and was turned out to pasture for a few years. Recently she was sent out for 60 days basic flat work training which she completed successfully without complaint of lameness from the trainer. Upon return to her owner's barn, both the owner and trainer at the barn noted that Classy would buck when asked to canter and just "didn't seem right behind". On physical examination Classy had no remarkable abnormalities execept for moderate fluid filling in her femoropatellar joints on both hind legs. The filling was soft and non-painful. On gait evaluation Classy was grade 1 lame (see previous post on lameness grading) on her right hind. She had a mild positive response to right hind hock/stifle flexion. She was sound and negative to flexion of the left hind. When observed on a longe line on a soft surface, Classy did not show overt lameness, but her hind limb gait was characterized by a shortened step and a rapid downward placement of her feet at the trot. When asked to canter, she had obvious difficulty executing a canter departure. When travelling to the right, she would only canter disunited, with the forelimbs following a right lead foot cadence and the hindlimbs following a left lead foot cadence. Tracking to the left she would occasionally canter in a united left lead canter, but also frequently cantered disunited. Her hind limb gait at all times during the canter was characterized by poor independent motion of her two hind legs - they tended to move together, suggesting a "bunny hop" quality. The combination of physical examination findings and gait evaluation were suggestive of a stifle problem. Radiographs were performed immediately for three reasons. First, intra-articular anesthesia (joint block) of the femoro-patellar joint to identify subtle lameness such as Classy exhibited is not routinely reliable - horses will not always "block out" even though the stifle is the source of the lameness. In general, lameness should be at least a grade 2 before intra-articular anesthesia is relied upon as a diagnostic tool. Secondly, from a strictly practical point of view, we were under time constraints, the intra-articular anesthesia would incur cost without a high likliehood of definitive results, and Classy was a somewhat fractious 5 year old likely to be uncooperative during placement of needles in her stifle without significant sedation. Thirdly, OCD was the most likely presumptive diagnosis for Classy, and radiographic confirmation of this diagnosis in combination with Classy's signs is considered definitive without intra-articular anesthesia. Classy was sedated and 3 views of each stifle were taken. The radiographs confirmed OCD in both stifles, the right significantly worse than the left. The x-rays were reviewed by a board certified surgeon and surgery is scheduled for next week! Cost $2500 - prognosis for soundness and full athletic function excellent - layup time 6 weeks. 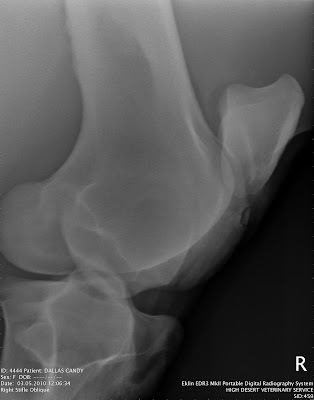 In Classy's case, the owner's astute attention to a relatively mild gait abnormality resulted in a timely diagnosis of a problem that left untreated would likely result in degenerative changes in the joint with resultant chronic lameness. Over the next few days we will look at OCD in more depth, and then return to Classy's case and discuss why her particular manifestation of this developmental orthopedic disease carries with it an excellent prognosis following surgical repair.